Contact us for private events. Burrata is the creation of Dejvi Furxhi and Albi Furxhiu. Business partners and cousins who not only co-own Burrata, but also help in seating guests, serving as chef, shopping the Italian Market each morning, making pasta in the kitchen and more. 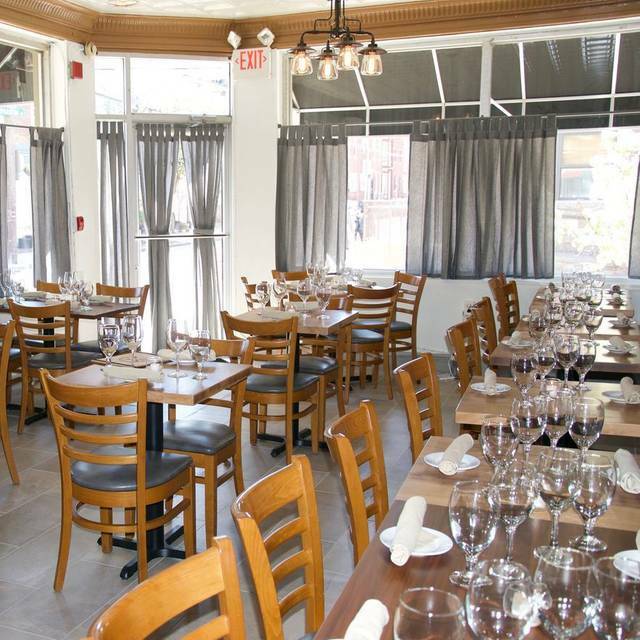 This Italian BYOB, located in the heart of Passyunk, serves authentic Italian cuisine with a modern twist. Burrata offers diners 2 and 4-top tables lit with tea light candles - perfect for a cozy date night or dinner with friends and family. 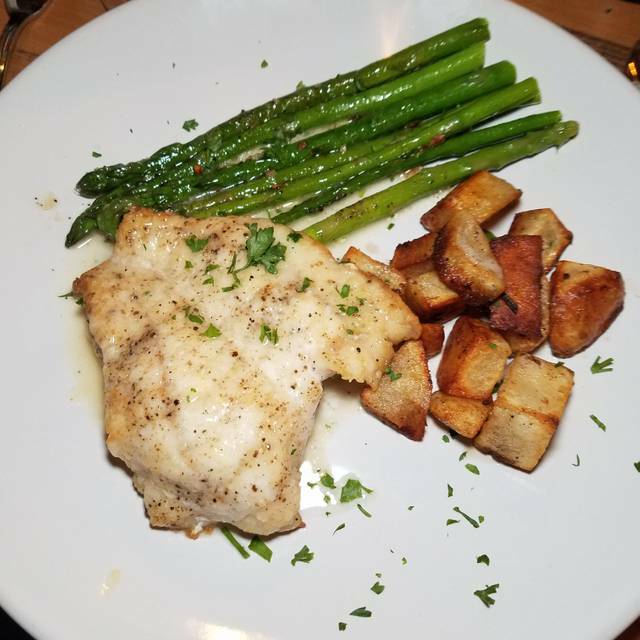 Experience the best and freshest produce, never frozen and cooked-to-order, with our homemade pasta dishes, seafood selections, and nightly specials. Do not forget to BYOB your fave wine, Rose or Prosecco. And make sure to end the night with something sweet from our "impossible-to-pass on" desserts. Make your reservation today! This is my favorite spot to go with my girlfriend. We especially enjoy the artichoke and burrata apps, then I go with the pappardelle and she does a seafood special. Tiramisu for dessert! Best italian food we’ve had in the city and BYOB! The food was delicious! Service was quick and friendly. It is a very small restaurant, so not good for groups, but great for a date or girls night. BYOB is always a plus in my book! Will definitely be back. Cute neighborhood restaurant with attentive staff. Remember it is BYOB! The service was haphazard at best, the noise was ear-splitting, the food only so-so. Why would we return or ever recommend this restaurant to anyone? We were welcomed back. Service was excellent, food was excellent. I highly recommend this restaurant. The food is great, they always have specials. Staff is awesome! Burrata was a pleasant experience. 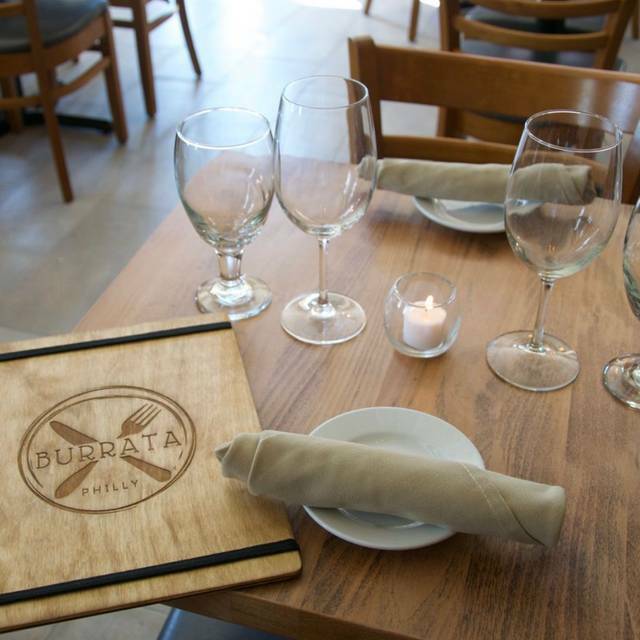 I love Burrata cheese so I have always been trying to dine at this restaurant. I went for a date night with my boyfriend and loved the fact that it is BYOB. The food was good, but not amazing! I had the gnocchi with truffles, which was super delicious, but my boyfriend ordered the chicken which was very bland and we were not satisfied. Only other complaint, was that it was extremely loud in there and I felt like I was screaming at my date who was only 6 inches away from me. Great place for a BYOB dinner. Pasta is delicious and the service was amazing. Very small restaurant so mare a reservation. The only downside is the location which is very far away from everything. 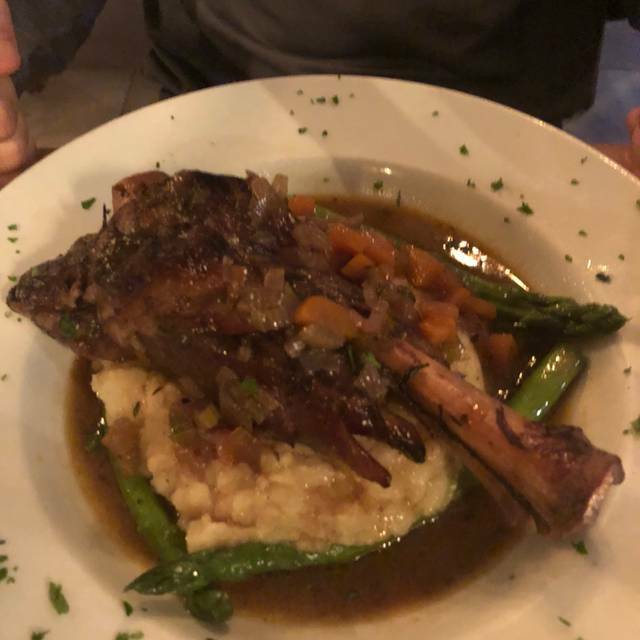 We were visiting Philly for only one night, so picking a restaurant for our group of four was important as we are all foodies. I did alot of research, and picked Burrata. We were all so pleased; everyone in the group was thanking me for selecting it. The food was delicious, the service outstanding, and we all enjoyed our evening. Second time we’ve been and once again everything was fabulous from start to finish. Couldn’t recommend them more. Wow! What a fantastic meal. My wife and I went for our anniversary dinner after reading some reviews. We had never gone here before, but the food, ambiance and service were fantastic. We split everything so we could try more food. It was all very flavorful and perfectly sized portions, even splitting in two. We got the Burrata, potato gnocci, lamb chop, with Tiramisu and coffee to cap it off. Again, the service was fantastic: the waitress and server spaced out our dishes so we could savor and talk over our meal, without overwhelming us or interrupting. It was a great decision. We would definitely go again. We’d recommend going early as it got busy quickly. I was looking for a special place to celebrate my boyfriend's birthday and I had read reviews about birthdays and saw a picture that Burrata had put a candle in a dessert for someone! The food and service were great! Unfortunately, after leaving a note in my reservation that it was for a birthday and asked or them to add a candle to the dessert or do something special AND calling the night before to confirm, they sadly did not do anything! I was very disappointed and had to apologize to my boyfriend for it not being as special as I had planned. For it being a smaller place, I expected better communication between the staff. 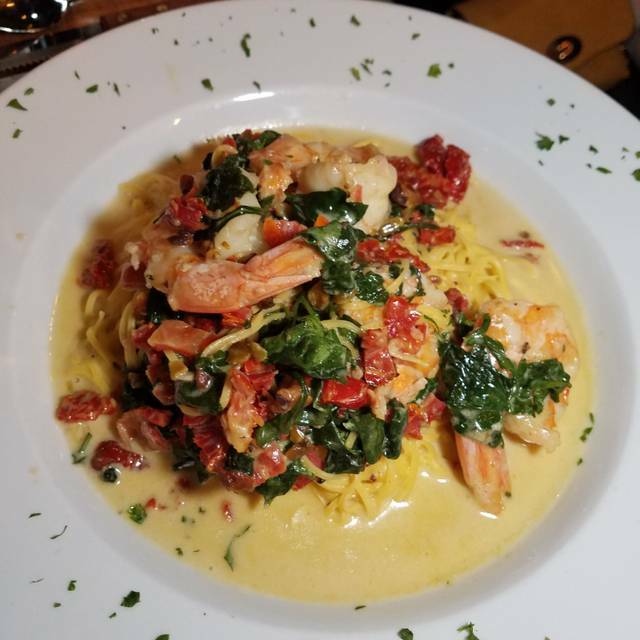 Delicious pasta, friendly staff, and the perfect setting for an intimate dining experience. My new favorite BYOB. the food was amazing as usual! and the service was great our waiter was soo nice! everything is soo amazing on the menu every time! As our meal was ending, one of the guests in our party turned to me and said "thank you for taking us here, we've been looking for a place just like this for years. 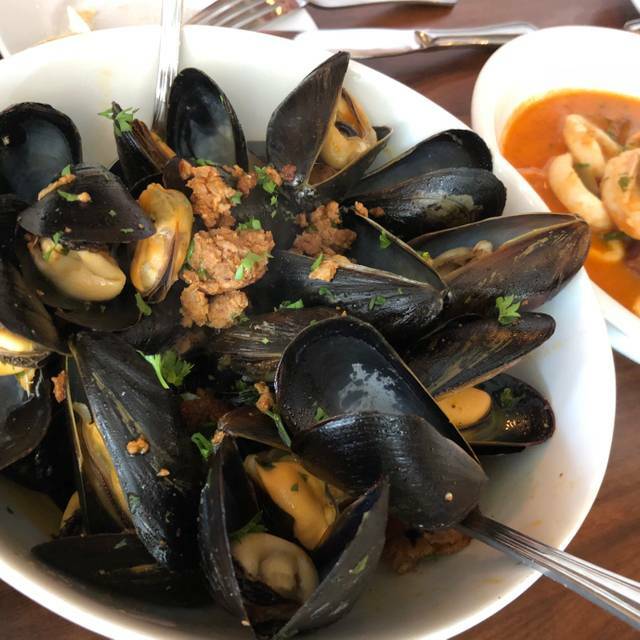 It's a perfect neighborhood spot, just the right feel, the staff is super nice, and the food is simply wonderful.” I couldn't have put it better myself. This is a great restaurant that never fails to please. Well run, with great food and a perfect neighborhood atmosphere. Burrata definitely is a hidden neighborhood gem. The food here is fantastic. Always fresh. Their prices are reasonable and well worth the quality and portion size your get. And of course, highly recommend trying something with burrata. The food was great and so was the service. The Burrata appetizer is fantastic. We had a great time. As usual, friendly welcoming service. Thanks Brett! Food was great . This place is a jewel in South Philly. Great food, Amazing service, energetic atmosphere, BYOB makes for a fun and fancy but an affordable night out with friends!!! I absolutely love this place. The menu is small and deliscious. Pasta is even better than in Italy. If I can give thousand stars I would. Could not be better. Wait staff, food and small atmosphere made a great evening. Two blocks from Federal stop on broad st line. State store two blocks away for this BYOB. We'll return. Again they provided us with a simply delightful dinner. The server was exceptional. 10s 10s 10s across the broad. Burrata is the type of fine dining that makes you feel good. The food is super fresh and delicious. I recommend everything on the menu even their rotating specials. This is my go to for fine dining. The owners and staff are friendly and professional. These guys really put care into the experience of Burrata. We had an amazing meal. The service was prompt and the food was delicious. I will absolutely be dining at Burrata again. The tables were too close, making the small restaurant even smaller. The waitress and waiter were very good, prompt and attentive. The food was very good. They could use a more roomy waiting area, as those who are waiting have to stand right over people sitting at a table. Overall........very good, but too crowded. Hard to hear one another! Good service and tasty burrata though. 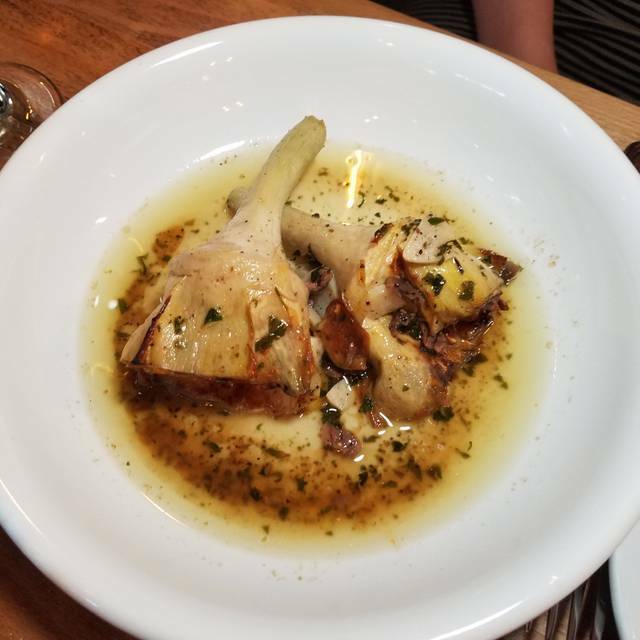 We first visited Burrata when it opened in May of 2018. On that night, the waitstaff was beyond friendly and appreciative that we were there. The food was only okay, but that was to be expected on its first weekend of opening, so we decided to wait awhile before we returned. We made it back on Sunday, March 24, and it was immediately apparent that things had changed — but not for the better. We had reservations for 7 p.m., but the restaurant was full when we arrived. We stood in the tight doorway for 20 minutes waiting for a table to be free, and were rudely pushed aside at least twice by the waitstaff, who made us feel like we in their way. We were finally seated—again, 20 minutes late—but we were never offered an appropriate apology for having to wait so long after our reservation time. The chef even had the gall to charge us an extra $2 when I asked to replace the potatoes on my dish with steamed spinach. I mean, yeah, it's only $2, but you'd think they'd at least waive that upcharge after we had to wait so long, but no. 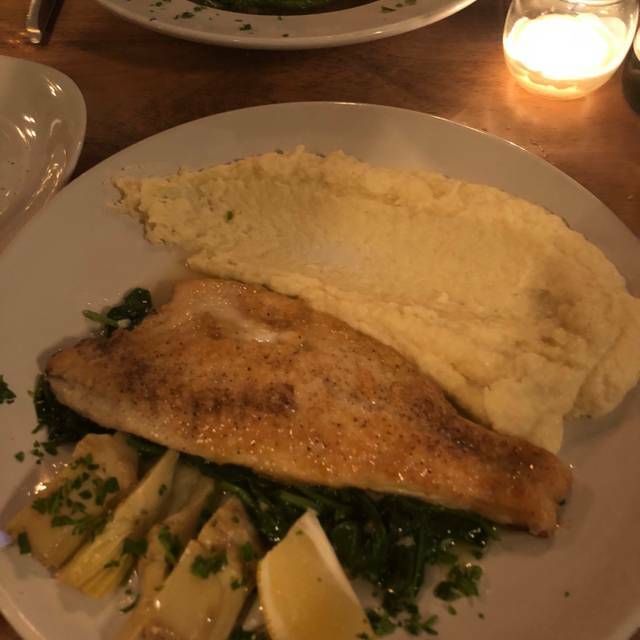 The meal was actually delicious, much better than it was the first time we visited, but the night was soured by the long wait and the waitstaff's inability to recognize the situation. We felt unappreciated, which is particularly a bummer coming from a restaurant that's located just around the corner from our house. We were semi regulars at August (the restaurant that was there before), often taking friends and family who were visiting from out of town, but we won't be returning to Burrata—or recommending it to anyone. Boo. Burrata comes through again. Full restaurant on a Sunday evening. Who knew? Can’t resist the Stufato and Burrata appetizers. Actually I can’t even order Burrata anyplace else. Entrees were awesome, Salmon, Orecchiette w/pesto, ravioli w/blush sauce and pork chop special. Also loaded up on sorbets (lemon & coconut), chocolate chip cannoli & tiramisu. If you go to South Philly you gotta go to Burrata. Great service and food-- very pleasant dining experience. My husband and I had a reservation for 7pm on a Friday evening. The service and food were wonderful. We had the Frisee Caesar, Mushroom Gnocchi, Wild Boar Taglitale, Garlic Kale, and the Cannoli. We would happily order all of them again. Prices were in line with the portions and we loved that it was a BYOB. The server was attentive and very accommodating. The food was fresh and delicious. A special place. It has it all. The food is wonderful and the service is impecable. My wife and I tried Burrata for a Pre-Valentine Day dinner. Dining room is small but comfortable. The staff and waiter were friendly and patient with the pace of service just right. Their menu is small but ample. We especially enjoyed the pappardelle with the wild boar ragout; the lamb shank and the artichoke appetizer. Dessert was a wonderful bread pudding. We will definitely return to try a few of their other pastas and entrees. Pleasant enjoyable meal accompanied by fun music. Monkfish was well prepared . 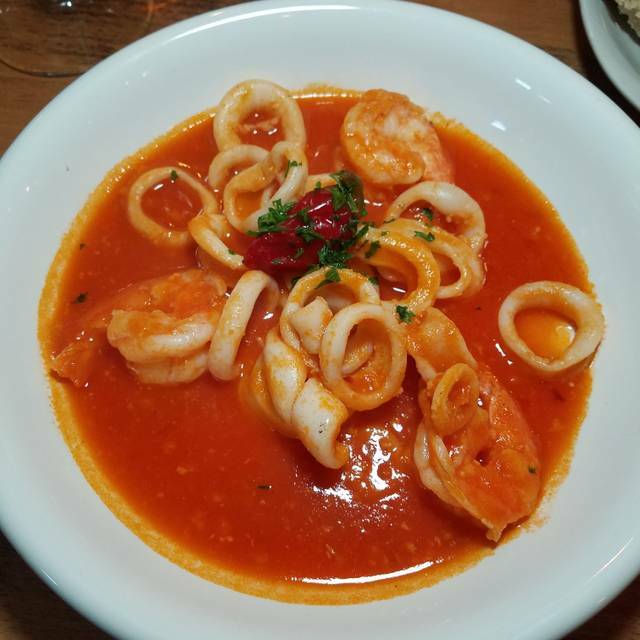 The Seafood fra diavolo was in a delicious but not spicy broth. There were hot pepper flakes available to adjust the temp. The almond creme brulee was outstanding.